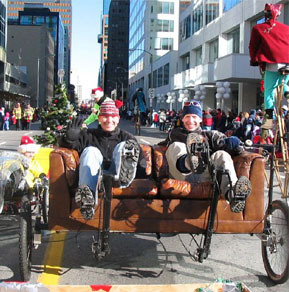 We almost didn’t make it to the Ottawa Toy Parade. I arrived at Steve’s place in Ottawa last night. 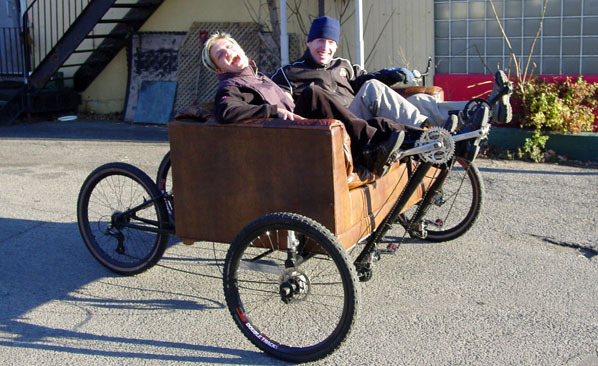 This morning, we assembled the Couchbike and mounted Steve’s spare couch in time for an easy cruise downtown to meet up with Mike Watson and the rest of his crew from the HPVOoO. As we were about half way there, Steve looked down at the wheel on his side of the couch and reported that things were looking pretty wobbly down there. 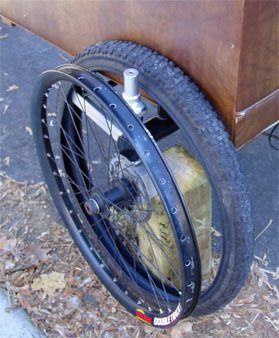 Before either of us could fully assess the seriousness of the situation, several spokes gave out and entwined themselves in the disk brake rotor. We pulled over and set out to fix the wheel. Unfortunately, I hadn’t bothered to bring any spare spokes. Thank goodness that a kind stranger with nearby access to some bike tools happened upon our wreck. 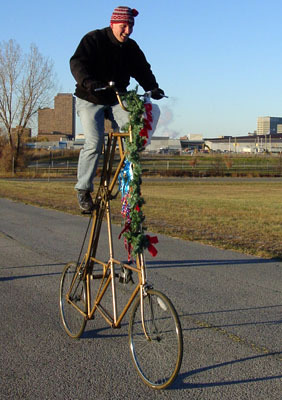 However, he didn’t have any spare spokes either, so Steve had to race back to his house to raid his own supply. 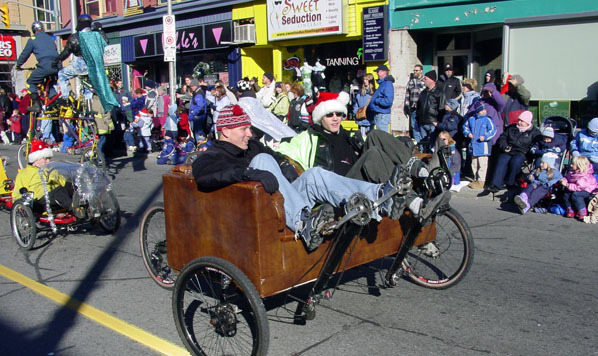 As luck would have it, we got the wheel repaired and were back on the road in time to join the HPVOoO group a just a few blocks from the start of the parade. The parade was a good time. 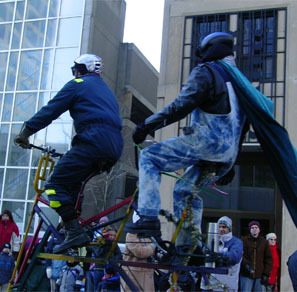 We switched up our spots on the bikes and got to try a lot of the wacky creations built by the Ottawa group. After the parade we went to the Royal Oak for a late lunch. I got to take our waitress out for a quick ride in the parking lot. 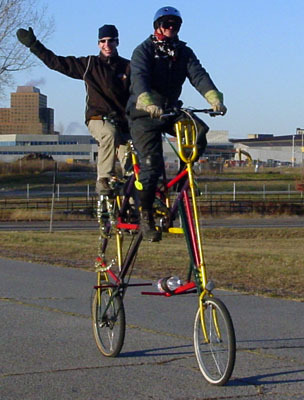 After lunch, Mike let Steve and I try his tall bike and tall tandem out on the Ottawa bike paths. Wow! Was that ever fun. Thanks Mike! 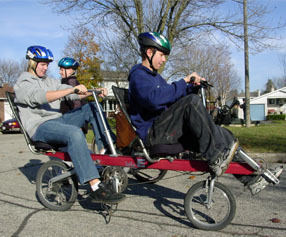 Today, Eerik had his scout troop around to try out some wacky bikes. Although the scout troop is based in Toronto, they’re all of Estonian descent, so all of the meetings are held in Estonian. They split into groups for lunch. Each group had the same amount of money to spend at the store for supplies. One group had hot dogs. The other group at spaghetti. Good times! 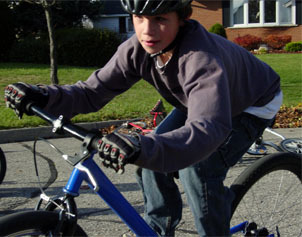 You are currently browsing the Bicycle Forest Blog weblog archives for November, 2004.